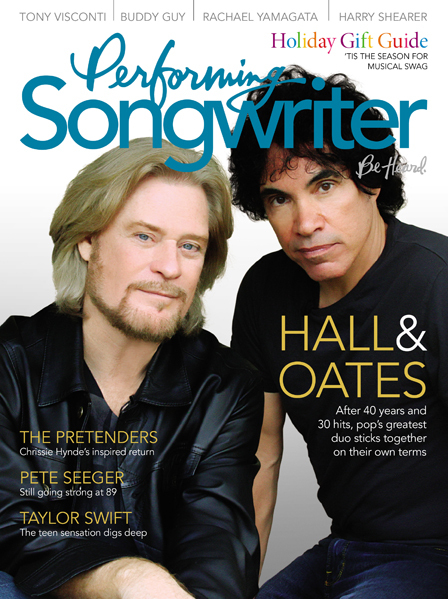 Interviews with Hall & Oates, Chrissie Hynde, Buddy Guy, Pete Seeger, Rachael Yamagata, producer Tony Visconti, Taylor Swift, Pete Seeger, Mavis Staples, J.D. Souther, Mavis Staples, Dave Mason, Dido, Annuals, Harry Shearer, Susan Tedeschi, Brett Dennen and Jamey Johnson. Jill Sobule searches for the Republican artist in her column. Plus the holiday gift guide, a visit to Nashville’s RCA Studio B, the story behind the Pogue’s “Fairytale of New York,” and Henry Diltz’s parting shot of Dan Fogelberg.